That's it! 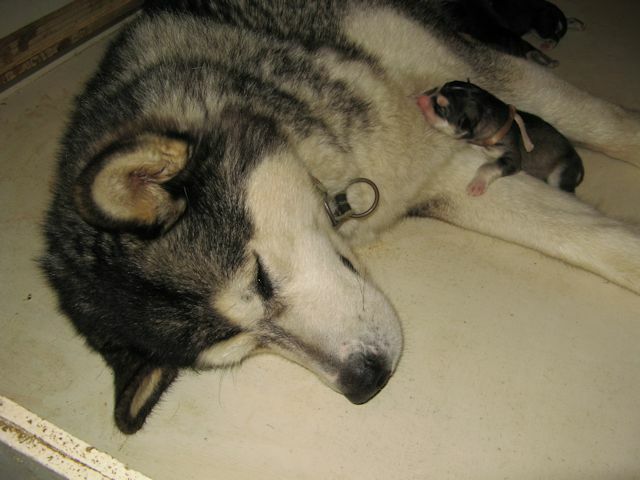 The Malamute puppies of our second litter are born !!! 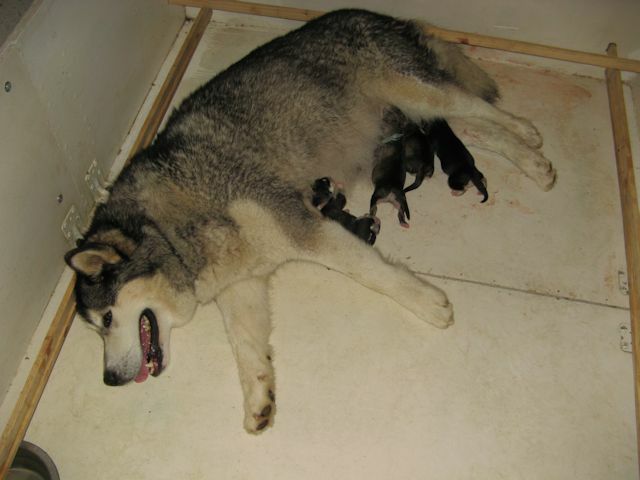 For our first litter, we were a little bit "care-free". For our second litter, we decided to do an X-ray at 52 days in order to count the number of squeletons and so to know the number of puppies to be born. Our prefered vet don't have a numeric X-ray machine, so he advices us to go to his colleague who has a such machine. 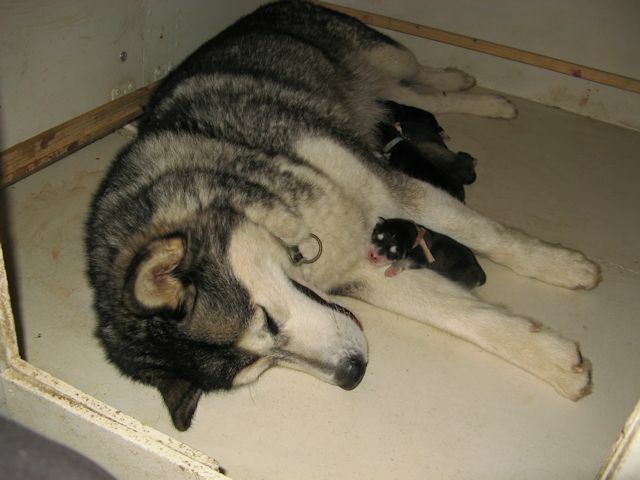 His colleague sees 6 puppies and maybe 7, but it is unlikely. His colleague send me the numeric X-ray by email and from my computer I see 7 squeletons. I'm not a professional of the reading of X-ray, so I send the X-ray to my vet, and like his colleague he sees 6 puppies. So, we are ready for 6 puppies. 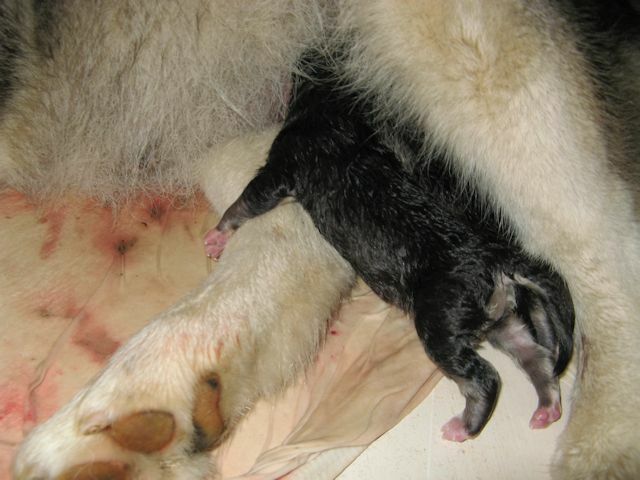 Wednesday 8 august 2012, Coleen show a slightly lower body temperature at midday, and at the end of the day, her body temperature is lower, but not at the same level than the first litter. 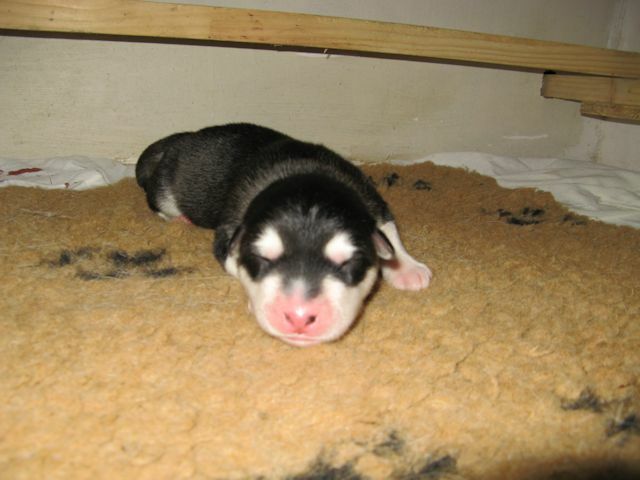 We think that the birth will be for the early morning of the thursday, 9 of august. The wednesday evening, Coleen is very nervous, and we decide that she will sleep in our house with her whelping box. Thursday at 0h30am, before we go to sleep, we put out Coleen to the garden in order she can do her needs, then she goes in the house. At 2h00am, I hear her crying, so I put her out and again she does some needs. 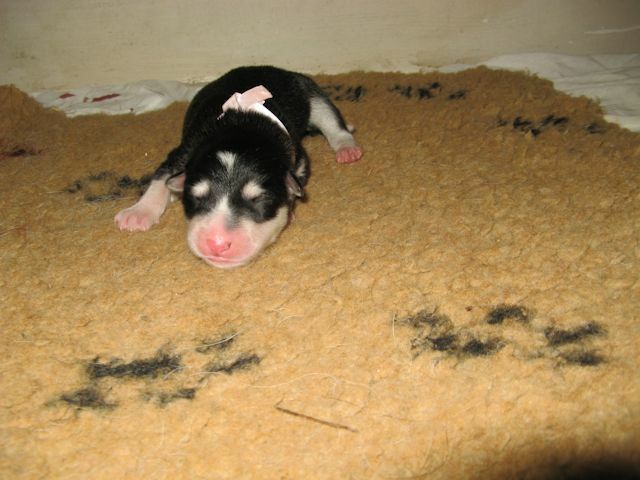 At 3h00am, again, she is crying, so I put her again out. No sign of contractions. At 4h30, she is crying again, so I think she doesn't need really to do her needs and I think she wants to dig a hole in the garden for her future puppies. 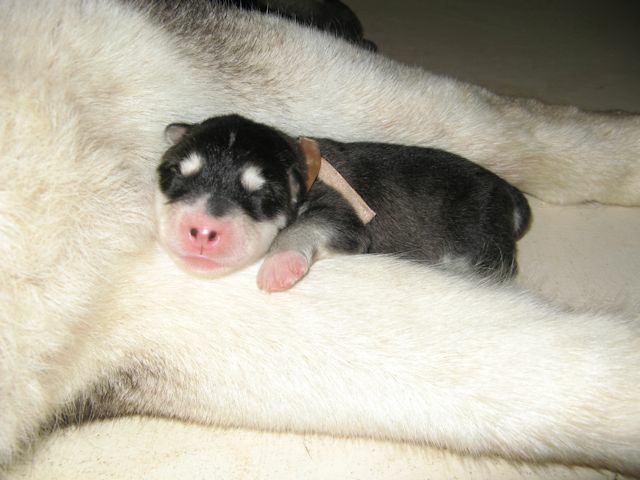 Suddenly, I recognize a cry : the first puppy is here. 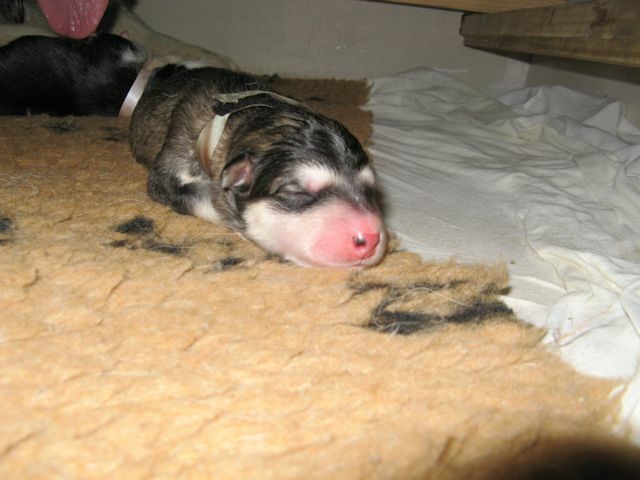 As we didn't really sleep, we go quickly to Coleen and we see a puppy in his sac. 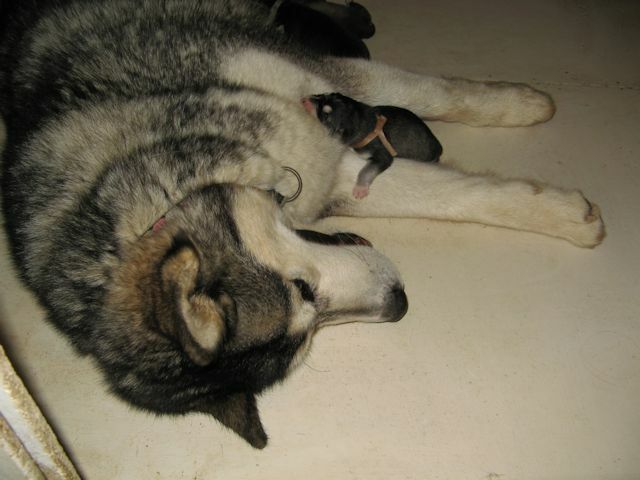 This puppy don't move, I cut the umbilical cord, I open the membranous sac, the puppy is a female, but she doesn't breath. 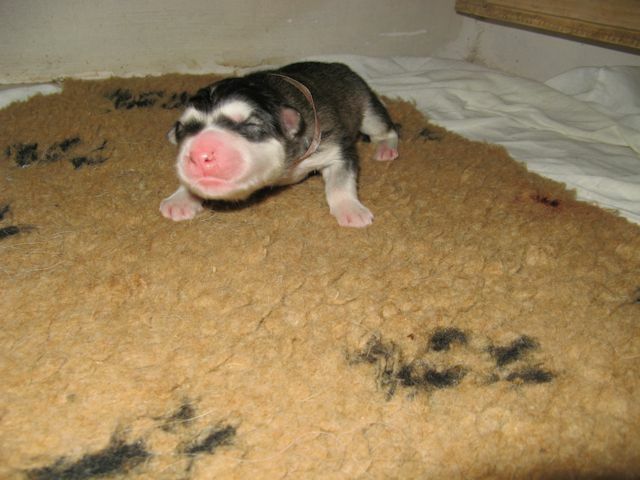 No panic, I have read that puppies can support some minutes without breathing just after the birth. I put the puppy with head down, and I rub the little body, but nothing. I encourage Coleen to lick her puppy, but nothing again. It's been 5 minutes and always nothing, it's very troubling. I try a last operation : I take a drinking straw, and put it the mooth and I blow, I feel the lungs inflate, but no life. This is the end, she will not breath. Coleen and I, don't understand what happens. I don't know what to do : let the puppy with Coleen, or move her away. I was not prepared to this event. With a dead puppy not in first arrived, Coleen would not realize that a puppy was missing, but with the first, she realizes that there is a problem. 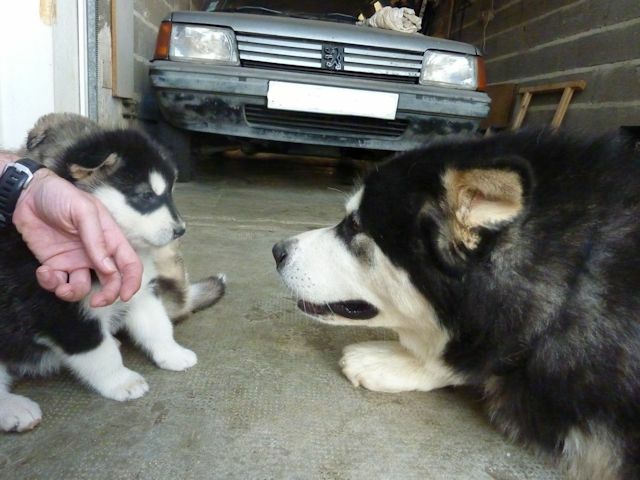 After 5 minutes, I decide to put away the dead puppy and we have to concentrate to the other puppies that would come. It's 5h00am and no new puppy and no contractions. From 5h00am to 6h30am, nothing, but Coleen is crying from time to time, it seems that is not a physical pain, but more as she searched her dead puppy. At 7h00am, we worry because during the previous 3 hours, there was nothing, and it's told that after 2 hours with no puppy, it could be dangerous. At 7h30am, always nothing : we decide to call the vet, to whom I explain the circumstance. He asks me if Coleen is pushing and I answer that she is not pushing and that she is very nervous. He advices me to wait up to 10h am and to carry her if at this time there was yet nothing. Also, he advices me to appease her because she could be too nervous for pushing. Indeed, I think that the loose of the first puppy and the fact that the others don't come, have caused for Coleen and us, a great stress. We go to the garden for a little walk in order to appease every body. 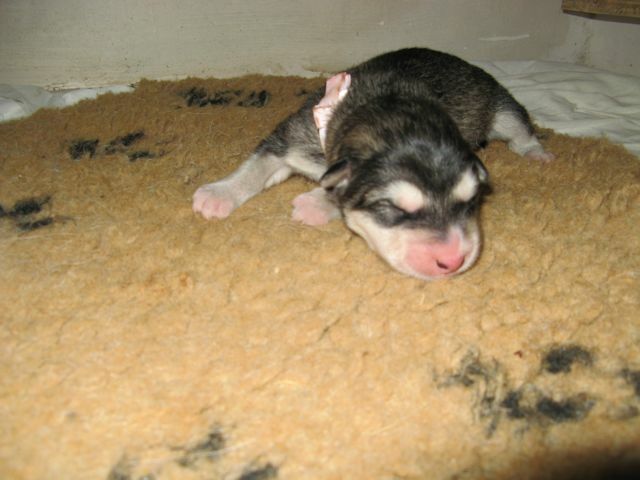 At 9h am, I think that we have to go to the vet : no puppy nor contractions. 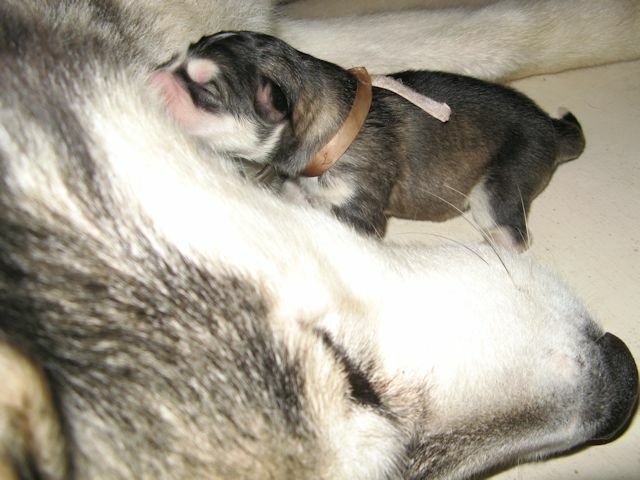 At 9h05 am, one cry of Coleen shows us that a puppy is comming : hurray, this puppy is moving in his sac. I help him to get out his sac and keep his head down in order the liquid go out of his lungs. The puppy coughs, it's a good sign. Coleen lick him, he moves good, I put him to the Coleen's teats in order he can drink the first good milk of his mother. 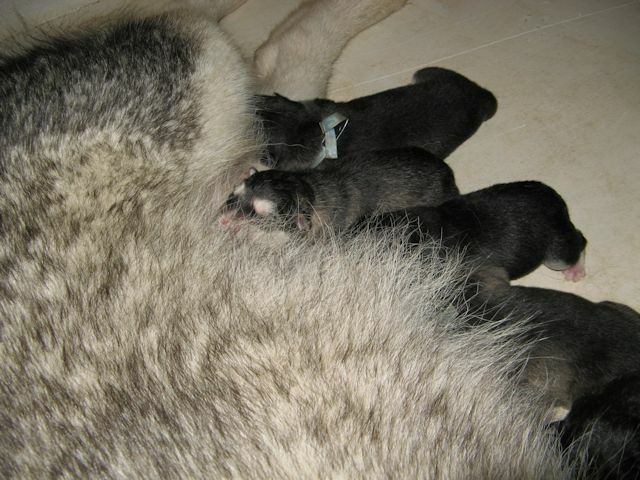 The puppy is a male, he is grey and he weights 585 grammes. All right, it's started !! ouf !!! 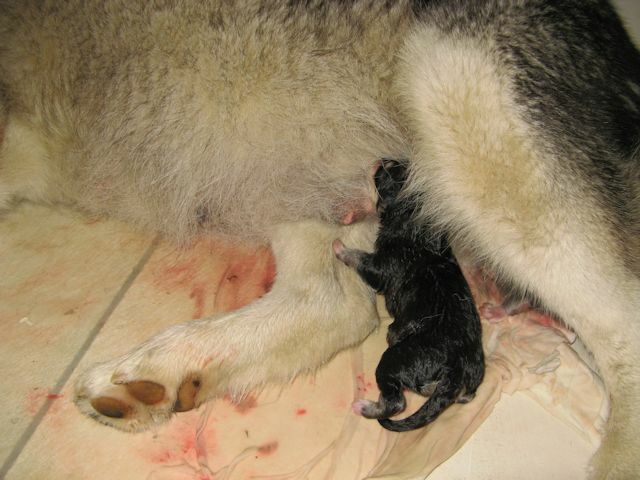 At 9h35 am, another little puppy arrives. It's a black female with a little bit of grey on the side and she weights 560 grammes. I'm a little bit worry because I find her not really alive. I encourage Coleen to lick her and I take care that she drinks the first milk. It's effective and after some minutes she is as alilve as his brother. 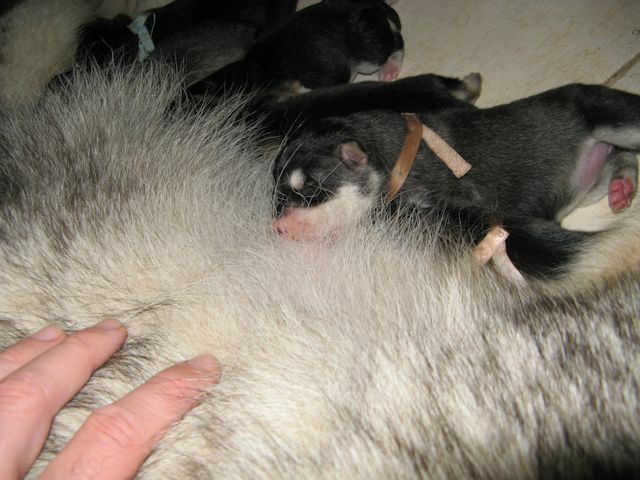 At 10h25 am, a new female is here, grey this time, she weights 590 grammes. 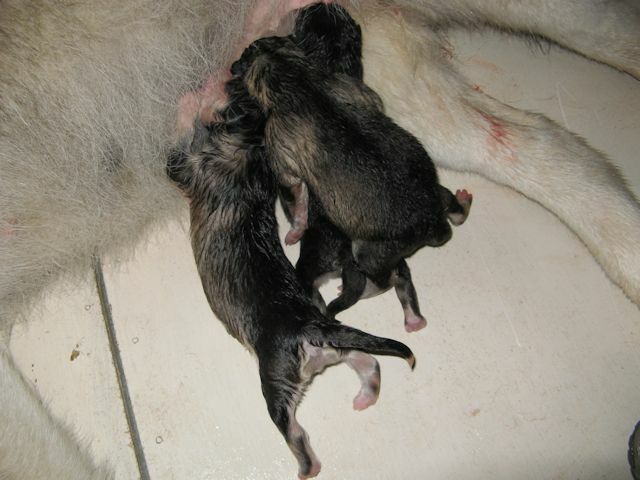 At 11h40 am, the second male is here : he is all black and strong, and he weights 640 grammes. He will be the biggest of the litter. At 1h50 pm, after a 2 hours break, Coleen gives us a new grey female who weights 580 grammes. 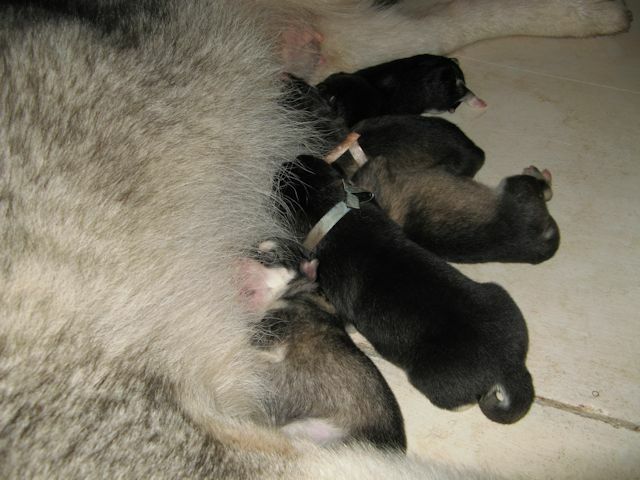 Following the vets, the puppy counts is done : we have 5 living puppies and the first dead puppy, it's 6 puppies. But my vision was the good one (or I was lucky), at 2h35 pm, Coleen give life Mais ma vision était la bonne (ou bien j'ai eu de la chance), à 14h35, Coleen give birth to the last female, black and with a little white spot on the head. As her previous sister, she is not very alive, and she weights only 515 grammes. I give her the same care and quickly she is gaining strength sucking her mother. 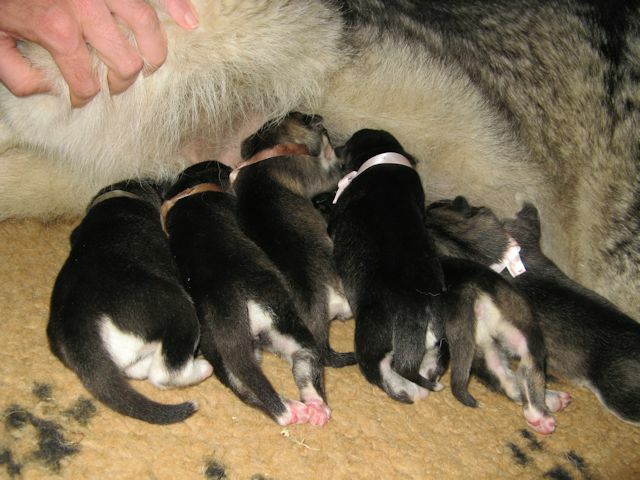 We wait yet 2 hours for the case there is an another litter. But now, it's the end of the whelping. 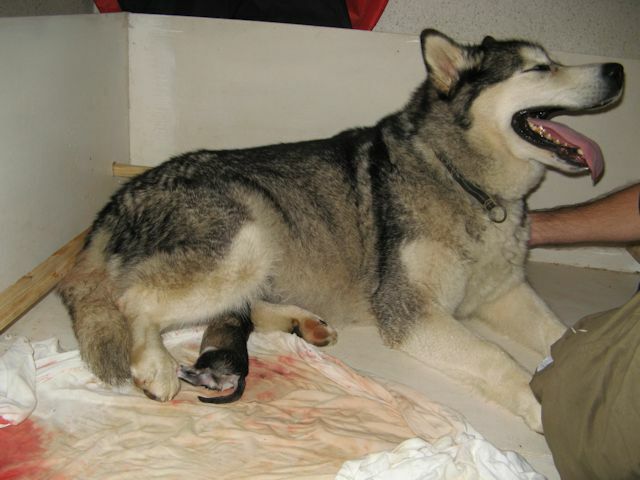 Now, it's time of the big cleaning : we have to clean the poor Coleen who is full of dry blood and the whelping box. Then we put a special whelping carpet in the box. Yeah !!! 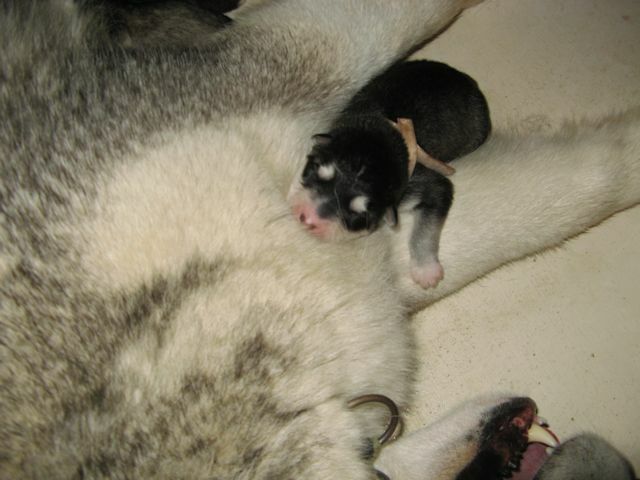 Finally, the other birthes go with success and we have a little bonus with an unattended puppy. A very good result, with a good homogenity, with first weights littler than those of our first litter, but it is the searched goal.